ਸ਼ਾਹੀ ਐਨਥਮ: "ਰੱਬਾ ਰਾਣੀ ਨੂੰ ਬਚਾ"
↑ D. Michael Jackson (2013). 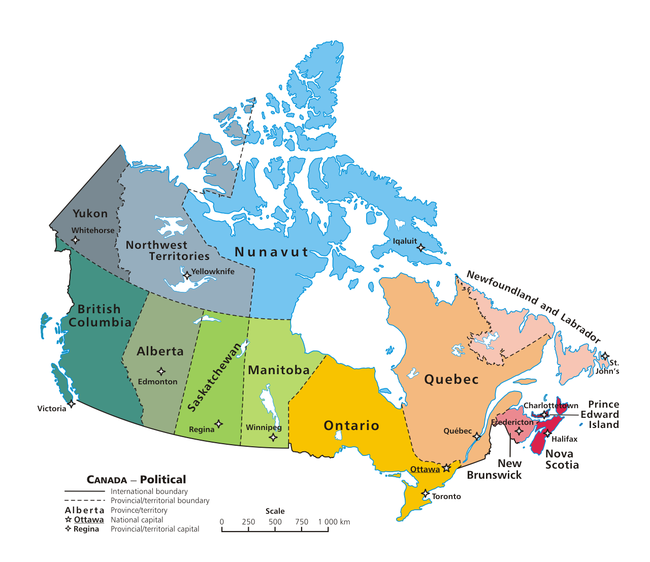 The Crown and Canadian Federalism. Dundurn. p. 199. ISBN 978-1-4597-0989-8. ↑ Hail, M; Lange, S (February 25, 2010). "Federalism and Representation in the Theory of the Founding Fathers: A Comparative Study of US and Canadian Constitutional Thought". Publius: the Journal of Federalism. 40 (3): 366–388. doi:10.1093/publius/pjq001. ↑ "CANSIM – 051-0005 – Estimates of population, Canada, provinces and territories". Statistics Canada. 2016. Retrieved December 18, 2016. ↑ Statistics Canada (January 30, 2013). "Population and dwelling counts, for Canada, provinces and territories, 2011 and 2006 censuses". Retrieved December 2, 2013. ↑ 5.0 5.1 5.2 5.3 International Monetary Fund. "Report for Selected Countries and Subjects: Canada". Retrieved August 13, 2016. ↑ OECD Economic Surveys: Canada 2018. OECD Economic Surveys: Canada. OECD Publishing. 2018. p. 10. ISBN 978-92-64-30073-6. doi:10.1787/eco_surveys-can-2018-en. Retrieved December 12, 2018. ↑ "Religions in Canada—Census 2011". Statistics Canada/Statistique Canada. May 8, 2013. Archived from the original on May 15, 2013. ↑ "'ਆਪ' ਵਿਧਾਇਕਾਂ ਦੀ ਬੇਰੰਗ ਵਾਪਸੀ". ਪੰਜਾਬੀ ਟ੍ਰਿਬਿਊਨ. 2018-07-23. Retrieved 2018-08-08.